Chinese hog. 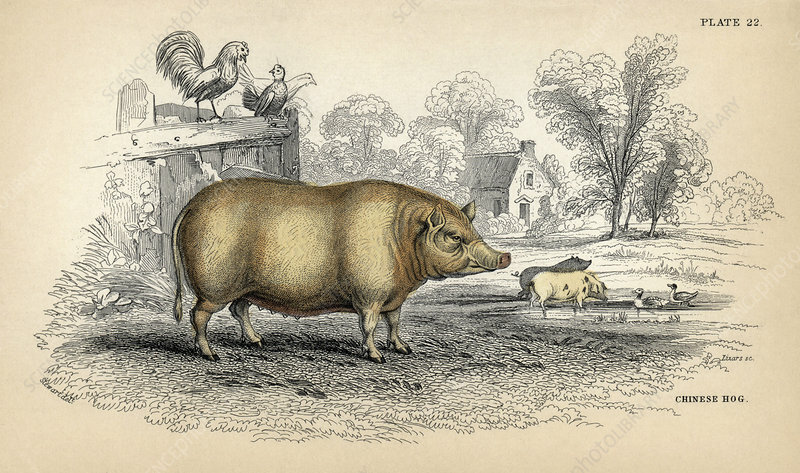 Chinese hog, a breed of the domesticated pig (Sus scrofa domestica), reared on farms worldwide for its meat. This handcoloured engraving on steel by Scottish painter William Home Lizars (1788-1859) is based on a drawing by James Stewart from 'Mammalia, Pachydermes or Thick-Skinned Quadrupeds' (Edinburgh, 1836), part of the 'Naturalist's Library' series by Scottish naturalist Sir William Jardine (1800-1874).